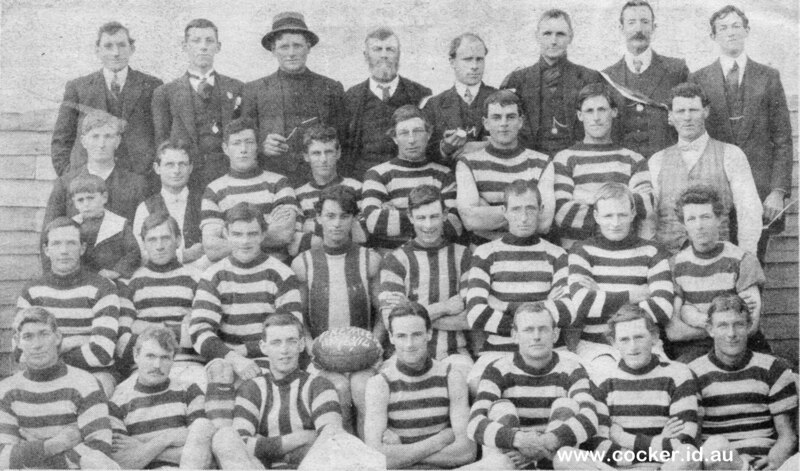 The Lower Barrington Rovers were football premiers in 1912, 1913 and 1914. This picture is of the 1914 team and was published in the Advocate on 13 May 1985 and in the 1985 book The Days of Our Youth: being a brief history of Lower Barrington with memories of students from the last years of the school's life by Three Old Scholars. Over half of those pictured live somewhere in our family tree. Edmund Rockliff: Edmund George Rockliff born 21 Nov 1894 Sheffield, son Henry Rockliff and Bessie Lord. Alf Ivory: Alfred Joseph Ivory born 24 Jun 1890 and brother of Charlie and James. Fred Costelloe: Frederick Costello born about 1891 to Richard Costello and Hariett Jones, brother to Vic. Les Bennett: Probably Edwin Leslie Bennett born 18 Jun 1883, son of Thomas Bennett and Sarah Cocker. Jo Rutter: Joseph Charles Pickering Rutter, born 17 Oct 1894 son of Thomas Samuel Rutter and Louisa Cocker. Note dark colour. His WW1 colleagues thought his brother Watty was of Maori descent. Herb Cocker: Herbert John Cocker born 22 Jun 1889, son of John Cocker and Rebecca Airey. Mascot Deril Ivory: Deril James Ivory born Lower Barrington 29 Aug 1909 son of James Thomas Patrick Ivory and Jane Bingham. James Ivory: James Thomas Frederick Ivory born Sheffield 19 Feb 1881 (father of Derril) son of James Thomas Ivory and Elizabeth Johnson Goss. Whatty Rutter: Walter Leonard Rutter (Watty) Rutter, son of Thomas Rutter and Louisa Cocker. After his death in 1916 in WW1 his twin sons returned from New Zealand and were fostered by Thomas and Ethel Goss. Bill Bennet: Probably William Marson Bennet born 5 Aug 1891 son of Thomas Bennett and Sarah Cocker and brother of Les Bennett. John Cocker: John Cocker born 22 May 1846, son of John Cocker and Sarah Elizabeth Briggs. Mac Moore: Malcolm Samuel Moore born 17 Dec 1877 to James Jessop Mawer and Isabella Findlay. He married Annie Louisa Cocker.